Angela Yosten: Momma got a brand new bag! Momma got a brand new bag! I love this bag! I made this bag for my mom for her birthday back in December. She wears black and white all the time, so I thought these fabrics would be perfect for her. I wanted to keep it for myself... love the black dottie on it... oh, well... will just have to make myself one now. It is even reversible! I used Amy Butler's Swing Bag pattern. For my mom-in-law's Christmas gift, I made her this bag using Amy Butler's Birdie Sling pattern. It, too, turned out very cute! I can't believe how big this bag is... great size for everything and very usable pockets on both sides of the interior lining. These bags were very fun to make! 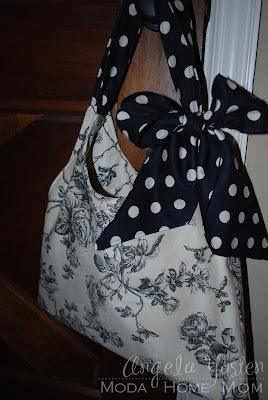 Great patterns... great fabric... great bags... great Mom's! Love you both! 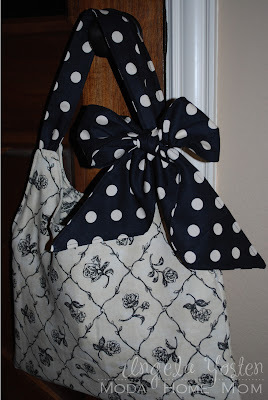 Love these bags...I'm going to have to try this pattern! You definitely should make one for yourself!!! I LOVE the black and white bag! So cute. You've made me want to stop quilting and take a break for some bag making! Those ladies are lucky to get such cute gifts! 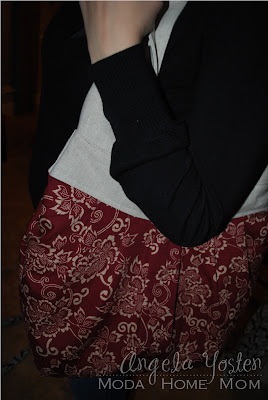 Completely in love with your bags---Great Fabrics. I'm wayyy tooo cheap to pay what they want in stores for bags. Hey Angela! Just wanted to say hi! I started a blog this year and my mom has been following it. She mentioned you had one so I googled "Yosten blog" and you were the first search result. lol Didn't think it would be that easy. Anyway, I am now following yours. i haven't made the first one.. but i do love the birdie sling pattern! your bags are super cute! Great bags!! Your moms are so lucky!! Love the poke a dot bow one. So cute!! Love the bags and I love the fabric too. I have that same fabric in the first picture. Now you've inspired me to make something with it!! Hope your son is doing better. 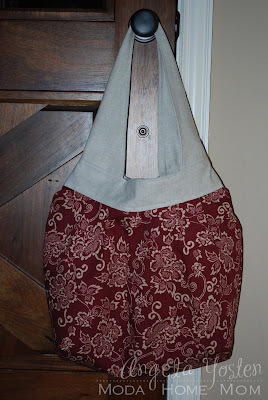 Those bags are adorable, and I love the fabric your used. I may just need to make me one! You know, this is about the 3rd black and white bag project I have seen on blogs recently and every time, it seems so fresh to me. I love it. She'll love it, too.